In stock -This product will ship today if ordered within the next 14 hours and 8 minutes. 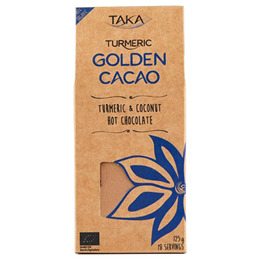 With a star-studded list of superfood ingredients, the TAKA Turmeric Golden Cacao brings thrilling new flavours to the hot chocolate experience. At the heart of this luxurious blend is creamy, decadent coconut. Next, come layers of chocolate, cacao and Ceylon cinnamon. Finally, Ayurvedic turmeric joins maca, peppers and Himalayan pink salt in an exotic encore of subtle flavours. Organic Coconut Milk Powder 26% (Organic Coconut Milk 97%, Organic Tapioca Maltodextrin [derived from Organic Yucca Root] & Organic Gum Acacia), Organic Cocoa 24%, Organic Raw Cacao 19%, Organic Turmeric 14%, Organic Ceylon Cinnamon, Organic Maca, Organic Ginger, Himalayan Pink Salt, Organic Black Pepper, Organic Cayenne Pepper, Organic Clove. To make a delectable Golden Cocoa, add 2 teaspoons of this mix in a mug with a little hot water to make a paste. Then add 200ml of hot milk, or a mixture of hot water and milk, stir up and steep for a few minutes. The Golden Cocoa is intentionally unsweetened, so you can enjoy this drink sweetened to taste. TAKA Recommends: Using your choice of frothed hot milk and adding agave syrup. This mix is also yummy added to smoothies and shakes. Below are reviews of TAKA Turmeric Golden Cacao - 125g Powder by bodykind customers. If you have tried this product we'd love to hear what you think so please leave a review.